It's here at last--the release of my first novel in my series, Loving Who, a sci-fi romantic-comedy full of Who fans and fun, is now available from Devine Destinies Books. Also available at Amazon in print and e-formats, and from other online retailers. You can read an excerpt below before I give my take on the "New Doctor." Screwball comedy meets the world of Doctor Who fandom. Cici Connors' life will never be the same and it all changes when she takes a mysterious man into her life—and her bed. John Smith makes the perfect Doctor for their club's fan film, but is he really good boyfriend material? His fondness for popcorn and whipped cream are the least of his eccentricities, as Cici discovers not everyone sees the same man she sees. When will John confess he's not from this planet? Will Cici regret having an affair and becoming mixed-up in an extra-terrestrial kidnapping plot? After all, how many alien assassins tracking her does one fangirl need? I don’t know when I began screaming, but my ears throbbed from my shrieks upon our arrival on a dark, featureless plain. I clapped my mouth shut and stared at John Smith, the man, alien, sentient being, who had made the unthinkable possible, the undoable doable, and in the process, had taken me to where I’d always wanted to go. “Look up,” he said calmly. I did. A million stars stabbed my eyes from a sea of the blackest velvet. A billion times better than staring through my souped up telescope. A trillion times better than pictures from the Hubble Space Telescope on the internet. He strolled toward what appeared to be a console and flipped a couple of switches. Low-level lightning came on about the walls and a hum of machinery filled the emptiness of the circular chamber. I continued to gaze up through the huge skylight window. “So many stars.” I had to close my mouth to keep from drooling. I gasped. My knees turned to jelly. The piercing lights above began to swirl about me. I could feel my breakfast rising as a wave of nausea swept over me. John caught me by the elbow and lowered me to sit cross-legged on the deck. You can read more about the other books in the series coming soon on my Loving Who series page by clicking here. If you can, please leave a review of my books on Amazon, Goodread, Facebook or elsewhere and let me know when you do so I can thank you. Loving Who was first written in the David Tennant era, so no, it doesn't mention the latest Doctor. It's about fans of both the classic series and the new. What do I think about the recent announcement of Jodie Whittaker as the Thirteenth Doctor? Well... I've not said much about the announcement online since I've been busy lately, and I've seen some fans attacking other fans over either liking or not liking the Beeb's decision. Some even attacked Fifth Doctor Peter Davison for simply voicing his opinion. That's simply not right. It's a TV show, folks. In the grand scheme of things, it's entertainment--not life or death. Peter and all Whovians deserve the right to express their thoughts in a respectful manner. So with that in mind, here's what I say about this latest bit of Who news. As an author myself, I'm not always sure it's a good thing to mess with another artist's creative vision. Verity Lambert and Sydney Newman (the original producers/show creators) created Doctor Who to be "family friendly" and "educational," but it has wandered far afield from this early concept. They made the Doctor a crusty, older British-sounding male, and cast William Hartnell in the role. If that's how they saw the character of the Doctor, who are we to argue with them? It would be like saying, "Huckleberry Finn is now a middle-aged, Chinese female instead of a young American boy." What would Mark Twain think of what you did to his character of Huck Finn? (Does a radically different Huck make sense in the context of the entire novel?) Since Verity and Sydney are no longer with us, we'll never know what they think about how others have interpreted their vision, but don't we owe it to their legacy to take care of their artistic creation? I wonder why the BBC doesn't start a new, completely unique show with a "Time Lady" (such as Romana or the Rani) instead. Then the new show creators could do whatever they like with the Time Lady character without the worries of upsetting fans of the old show or going against series canon. I hear rumors of actress Georgia Moffat returning as the "Doctor's Daughter" in her own television show, so it is possible to start fresh with a spin-off if you're feeling trapped by the older show's scope. Since the Doctor has regenerated thirteen times now--and has always been "male" in appearance and British in his speech patterns--why would he/she/it become "female" now? What good reason can one give for this radical change in the character? Why isn't the Doctor African or Asian instead? Why can't the Doctor speak with an American or Australian accent? Why does the Doctor have to speak English at all? Why not make the Doctor Brazilian or Mexican? The fans south of the border would love it! It just doesn't make much sense within the internal logic of the Doctor's character to change his basic make-up since it has worked so well for the show for almost 54 years. Such a radical change comes across as a ratings' ploy more than an artistic choice. Is the show in such trouble that it needs to pull a "stunt" to gain new viewers? What's the real motive behind this "gimmick"? 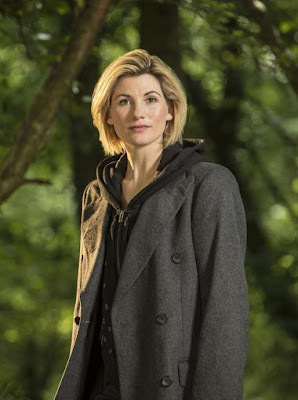 Still, Jodie Whittaker is a good actress, and it's worth a look to see how she handles the part. I wish her and the new showrunners the best of luck. Fingers crossed they give her decent scripts to act and not the poor quality scripts Peter Capaldi was sometimes stuck with. It's the poor scriptwriting of the newer Who series that's disappointed me at times--never the actors, settings or SFX, etc., which are generally first rate. Having studied screenplay writing and film critique, I hate to see opportunities wasted to create brilliant science fiction on screen. The talent is out there writing-wise, BBC. Please use it! Loving Who now available from Devine Destinies Books and other fine online book sellers!